In 2008, George Kuh, founding director of the National Institute for Learning Outcomes Assessment, developed a collection of “High-Impact Practices” (HIPs) based on many years of data from the National Survey of Student Engagement (NSSE). These experiential learning practices promote student learning through active engagement. Since then, most colleges and universities across the country have begun moving toward incorporating many of these HIPs into their curriculum. The curriculum at PUC already included several of the HIPs, such as collaborative learning, internships, undergraduate research, study abroad, writing-intensive courses, and service-learning. While the college was already providing capstone opportunities, in 2010, it intensified efforts to make “culminating experiences” available to all bachelor’s students. This included experiences such as a capstone course, internship, senior project or thesis, comprehensive exam, or portfolio. Though many departments were already requiring a senior project for each of their seniors, the 2010 change in curriculum at PUC meant that 100 percent of all bachelor’s degree recipients graduating from PUC had participated in some kind of culminating experience. In 2015, the last time there was a NSSE survey done on the PUC campus, over 70 percent of all PUC students* responded they had done or were in progress of completing their culminating experience. This was 16 percent above other Adventist schools, five percent more than similar schools, and a whopping 20 percent more than PUC’s benchmarking schools. We chatted with several seniors from various areas of campus who have completed a culminating experience here at PUC, and below is a summary of their experiences and what they learned from it all. * Though 100 percent of bachelor’s degree candidates complete some sort of culminating experience, this number includes associate’s degree candidates, who are not required to complete culminating work, and students who may not realize they have participated in such an experience. Writing emphasis majors: 20-page creative project accompanied by a 10-page reflection and analysis of the project. This begins at the end of their junior year and requires an annotated bibliography and proposal that the department faculty must approve before they are allowed to continue. They all then do a 15-20-minute presentation on their topic to the campus. I analyzed Zora Neale Hurston’s philosophy in her novel, Their Eyes Were Watching God, specifically in her methods of achieving happiness and satisfaction through transgressing societal norm. Basically, society has constructed expectations for its members, but these expectations are often followed simply for fear of rejection, not because an individual actually wants to act on them. Hurston shows, through her main character, Janie, how one can access true happiness and satisfaction by acting from internal volition instead of society expectations. I wrote a paper for my American 20th Century lit course last year and fell in love with Hurston’s work and philosophy. I connected deeply with her writing and message. It really speaks to American identity, which I am extremely interested in, as we are one of the most diverse but politically challenged countries in the world. How did your PUC experience prepare you for this final project? Because I have written so much during my undergraduate career, I felt confident in constructing a more complex argument—excited, even!—as I had a chance to argue a topic that I never had to space to do previously. What’s something you learned that surprised you? How difficult it is to restrain yourself when writing about a topic you love. Even in a work of this size, I had to be focused with what I brought into my argument. I didn’t know how difficult it would be to narrow that argument. I intend to begin graduate school in the fall, hopefully at Rosemont College in Pennsylvania to get my degree in publishing. I explored self-construction (how we determine who we are going to be) in Sylvia Plath’s novel, The Bell Jar. I examine the "scripts" for womanhood the novel presents to the main character, and how she rejects each one in favor of creating her own model for adulthood. Interestingly, Plath leaves Esther's story unfinished, so her struggles aren't actually resolved in the text. But we do know that her journey isn't over, and that she can and will continue to fashion her own identity. I fell in love with the novel when I took Dr. Linda Gill's British Modernism class. Sylvia Plath is better known for her poetry, so her novel is punctuated with beautiful language, but it is also raw and vulnerable in its portrayal of mental illness and the difficulty of being a young woman in American society. I think college also marked a "coming of age" for me, just being away from home, encountering new ideas, and looking ahead to my future. So that prepared me to tackle the idea of growing up. But I was able to complete the project mostly because the English department is full of amazing professors who work hard to make sure students have the necessary skills to express their interesting and sometimes complicated ideas effectively. As I continued to revise and reshape my thoughts about my topic, I stopped noticing the length of the paper because my advisor made me so excited about explaining one aspect of my argument or another. It's really helpful to have an advisor who is as excited about your project as you are, and Dr. Gill took time out of her own summer break to encourage me and help me complete my thesis. I think the biggest shock for me came after I sent my fifth draft to Dr. Gill, concluding with a tidy image of Esther finishing her journey and living happily ever after, when really that ending didn't fit with the actual text. Linda pointed out the inconsistencies in that ending, and told me I could actually say that Plath didn't leave us with a tidy ending. I was surprised to think I could just say “we don’t know.” So yeah, as long as that answer was productive (meaning I didn't use it just to avoid working through the ending), it was a legitimate move for a literary scholar to make. But don't try this at home without professor approval, kids. I’m headed to University of Rochester in New York to begin a Ph.D. program in English. I want to teach at the college level and hopefully publish some of my scholarly work. A capstone course in which each visual arts major produces a body of work of professional portfolio quality, which begins with research on a chosen topic of the student’s interest and then the project synthesizes their development in the PUC visual arts department. Students begin this process their junior year, and work with a faculty mentor. They have multiple presentations, journal, and complete the project itself. Many students put several hundred hours into their project. For film students, their thesis project culminates in the Diogenes Film Festival, held at the Cameo Theater in St. Helena. 19 Perspectives is an installation that includes brief stories, experiences, and opinions from 19 PUC students (including myself) who have racially mixed ethnic backgrounds. 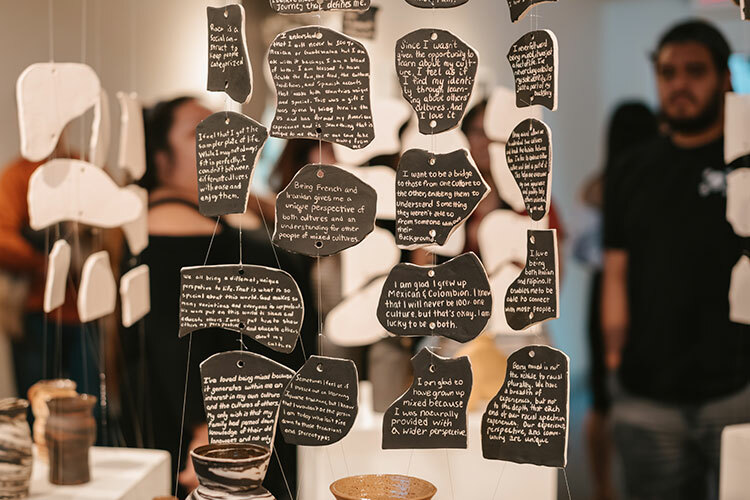 These perspectives are represented by handwritten quotes on clay tiles from 19 different people accompanied by 28 expressive ceramic vessels. My hope is to not only bring awareness to the mixed racial community but also bring the viewer to reevaluate their thoughts and how they treat others. I chose clay because it is a very expressive medium that can be formed in ways unimagined. The specific technique I used for the vessels is called agateware, in which I combine clays without fully mixing them, so when they are made, uncontrollable swirls of different colors are shown. I feel this technique represents people in general; we do not decide ourselves how our genetics will affect our appearance. I have left the clay bare to embrace those different completions that are untraditional to what we are used to seeing ceramics to be. As for the handwritten clay tiles, I wanted my 19 interviewees to write on clay themselves. There is something that is deeply personal when you see all the different handwritings together. All art classes as a whole focus on how to conceptualize rather than only being good at the technical aspects, and I feel that this skill has strengthened me personally as an artist. For my senior thesis in particular, the diversity at this school allowed me to explore my own ethnically mixed background. Before PUC, I never talked about my background because being mixed was not a norm. I felt out of place, or felt I wasn't enough of one side of my culture or the other. I met someone at PUC who is also with mixed background and we spent hours talking about what it actually means to be a mixed person in America. This experience was the source of inspiration, so I found 18 more people to talk to and include in the project. What’s something this project taught you? I learned that I want to emphasize my art career in ceramics and clay. It’s a medium with which I can express myself best, and no matter how many hundreds of hours I put into handling clay, I never get bored of it. I’m actually starting a job with a local ceramics company where I interned. I start this summer. In this two-quarter class, students formulate a communication-related research question, design an original survey instrument, gather data, analyze that data using inferential statistical tests, and write a formal academic research paper of sufficient quality to be submitted to an undergraduate research conference (if they choose). They also formally present their findings at the end of the second quarter at the Communication Department Research Symposium. I was part of a team of four students who surveyed more than 200 individuals from varying backgrounds to find out the demographics of people who knew more about their healthcare rights. We found that only two led to an increased literacy in rights as a patient: Being older and identifying as white. We chose this topic because we couldn't answer straightforward questions about the privacy notes we regularly sign at our doctor's offices. Studies show that being more literate in healthcare rights leads to better treatment, so we thought our study would be pertinent to the medical community. A concentration of communication classes and copyediting helped us develop the rationale for an understandable and accessible law code regarding patient rights. We thought it was fascinating, although not unexpected, to find that patient rights literacy was pretty terrible across the board, despite significant helping factors. After graduation I’m moving to New York City to work for a tech/healthcare PR agency. For their capstone project, students reflect on what they have learned and experienced in terms of culture and language, to identify a topic in either or both of these areas, and connect it with something meaningful to them or an area they are exploring in other studies (such as a second major). They’re required to analyze the selected topic and produce an original work, whether creative or research-based, at a level reflecting their advanced academic standing. My senior project consisted of exploring social connotations and overtones as seen in French meal rituals, etiquette, and the presentation of food. I enjoy food and the French culture. I have often eaten in French households and wanted to see what the meal rituals had to say about French society. I was able to connect with people who helped me construct my thesis idea as well as provide resources. The French professor Mme. Jehanno was very helpful as well as professor Christian Pancorbo. I learned that procrastination kills. I also learned how ingrained and essential gastronomy is to the French culture. I will be working for an early intervention center called Ninos del Cielo, working with kids from infancy through age three. I examined a collection of 17th century French letters housed in PUC’s library. I looked into their context, and the kind of historical language change that can be observed by looking at this type of text. As part of my project, I transcribed a few of these letters and attempted to translate one. I chose to focus on a project that had a hand-on component because I had two other thesis projects. I wanted to do something different than the type of paper that I wrote for my English thesis and for Honors. This project gave me the opportunity to work closely with archival materials. An integral part of my plans for graduate study will involve interacting with archival materials, and this project gave me experience in that area of research. My time in France prepared me with the French language skills I needed to approach the letters. My Advanced Language Studies and Linguistics classes in English both helped me cultivate a sense of broader linguistic topics that I dealt with in my thesis. Also, for about a year I worked for Katy Van Arsdale in the library, which is what brought my attention to this collection. My experience working for her helped me learn about archives, and how to handle the types of materials I worked with for this project. Transcribing handwriting is hard! I didn’t expect this to be the hardest part of the project, but it was by a long shot. I have a newfound respect for scholars who have to work with paleography. Post-graduation, I will be attending the University of Connecticut as part of their English Ph.D. program. Students are required to take a strategic management course during their senior year. During the course, they complete a capstone case analysis based upon secondary research with performance improvement recommendations. My essay was a case study on the strategy and operations of Oracle Corporation. It was split into four parts: 1) analyze how their company is structured and managed; 2) an internal analysis of their finances and how they operate; 3) an external analysis of competitors and industry trends; and 4) recommendations for how the company can improve. I chose Oracle because I’m interested in data and technology, and they have some amazing innovations that support the work of a lot of organizations. The biggest preparation came in learning how to do proper research and think critically and analytically. I learned how to use those skills to think outside the box. How could I as some college student recommend some way an extremely large corporation could improve? But doing proper research and using critical thinking can create great things. Using those, all of us can have great ideas to bring to the table. After grad I’ll be working in healthcare finance near Sacramento.